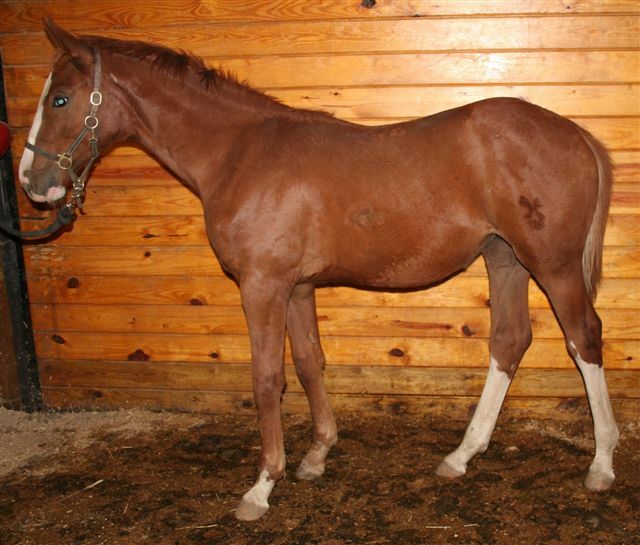 If this filly isn't super in her rideability, I will be shocked. She is so in tune to people. 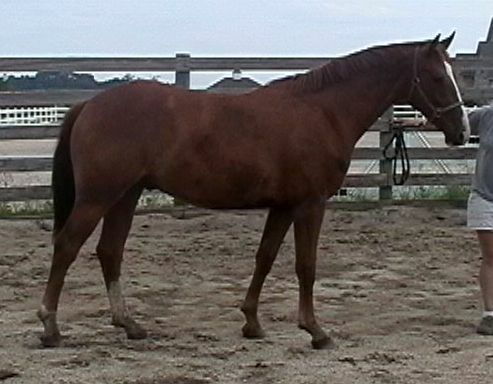 She is a fancy mover, too, with a super trot and walk. Lhayla was presented for stud book acceptance, where she received a 7.0, with 8's for saddle position and typiness/femininity. 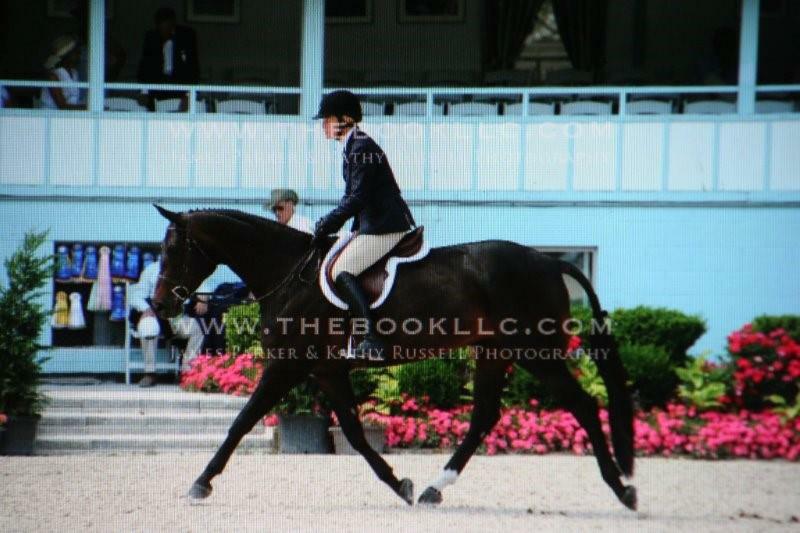 She was then ridden in the mare performance test by Sannon Ebert, who did a great job. She got a 9 for jumping form and an 8 for jumping ability in the free jump chute, 7 walk, 7.5 trot, 7 canter and 9 rideability for an overall score of 8.22, and the high score MPT sash! SOLD! congratulations to Kevin, Kelly and Shannon Ebert of Germansville, PA! See the new conformation photo taken 9/06. Gheoffrey has matured into a tall, really elastic moving colt. He gave me a scare at one month old when he came in from the field lame behind. 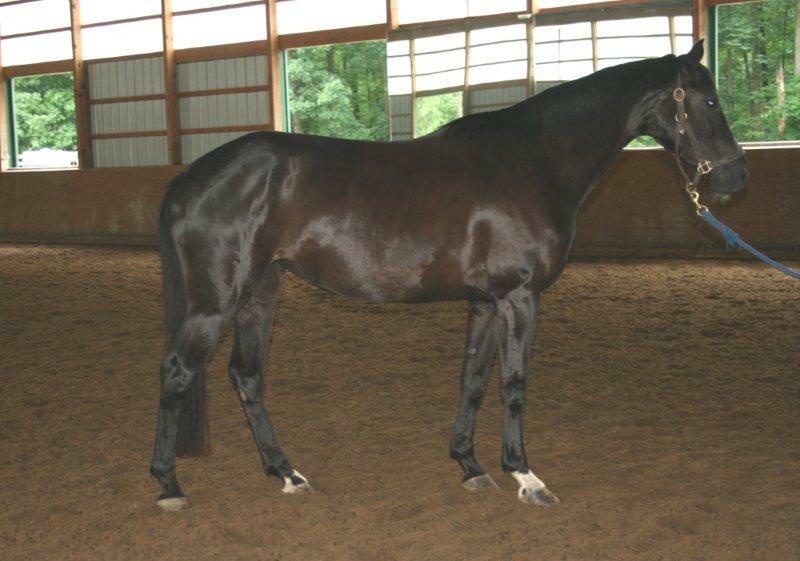 I had him checked by Mid Atlantic Equine vets and after numerous taps of his stifle and hip (hence, the clipped marks on the inspection photos), they found nothing. A week later he was sound as can be! PHEW! I don't think he is pretty enough to be a stallion candidate. 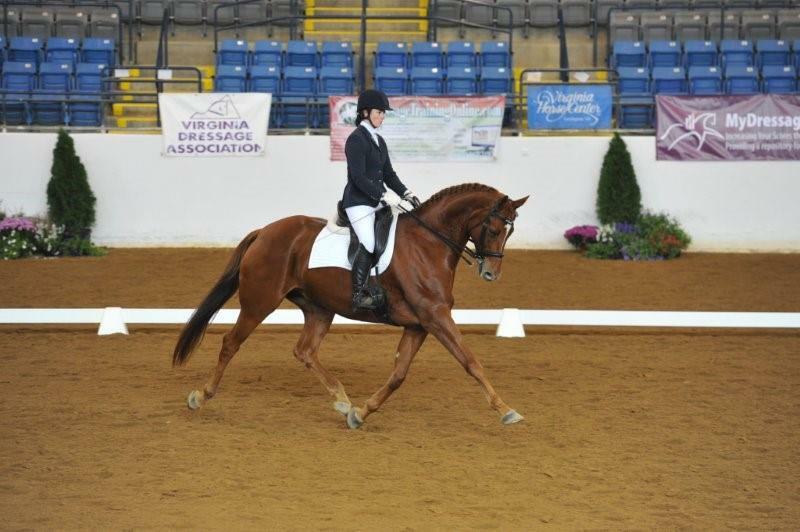 Get yourself a riding horse that will knock the judges' socks off with his movement. SOLD! 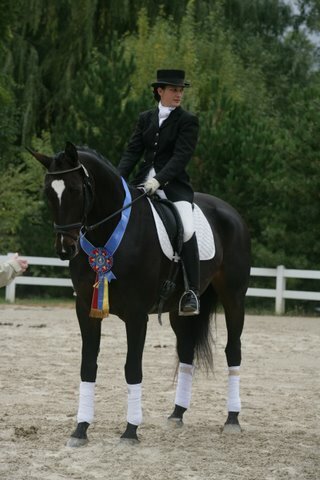 congratulations to professional dressage trainer/rider, Olav Drehn of Stanfordville, NY! 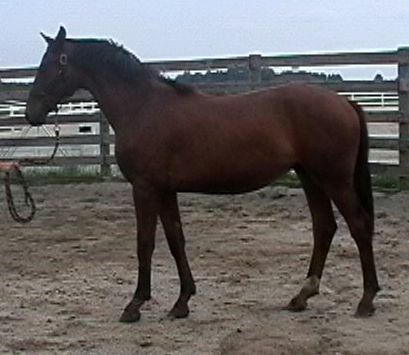 "Rocky" is a 16.1 hand bay gelding with a blaze (beautiful head!) and 4 white socks. Looks to have a HUGE stride. Very handsome. 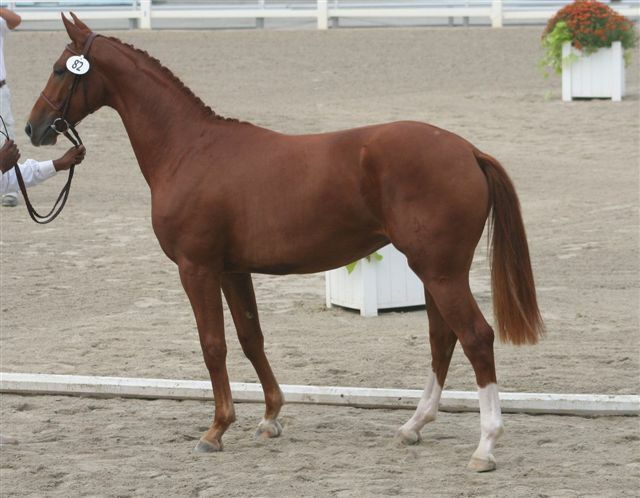 Full siblings have shown promise under saddle and have had much success in the breed shows. A Rolling Stone Farm homebred, he is by Gold Luck out of Elite Mare Whitney Q. SOLD! Congratulations to Jocelyn Mitchell of New Tripoli, PA! SOLD! Congratulations to two of my favorite riding students and friends- Beth Hart and her mother, Jane Ward are the new owners of this really nice horse! I look forward to teaching both of them, and Beth has hopes of doing the MPT this year with a better day for the free jumping. Ghlimmer just missed the score for EMC by 100th's of a point. See the new conformation photo taken 9/06. 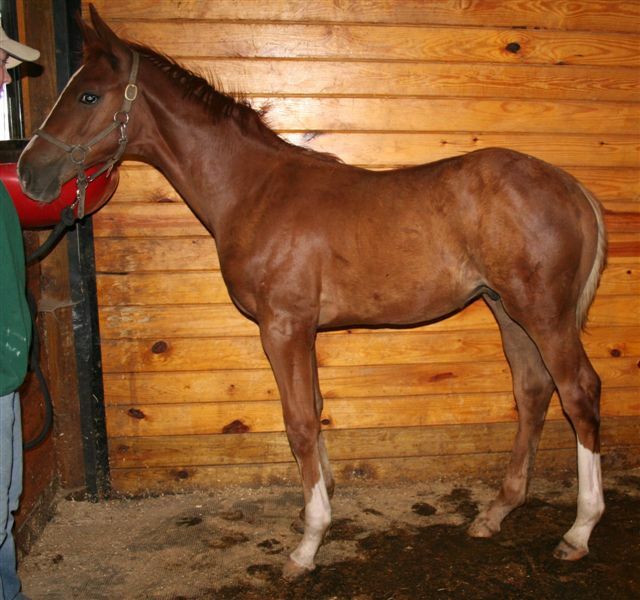 This is a very tall, leggy filly. 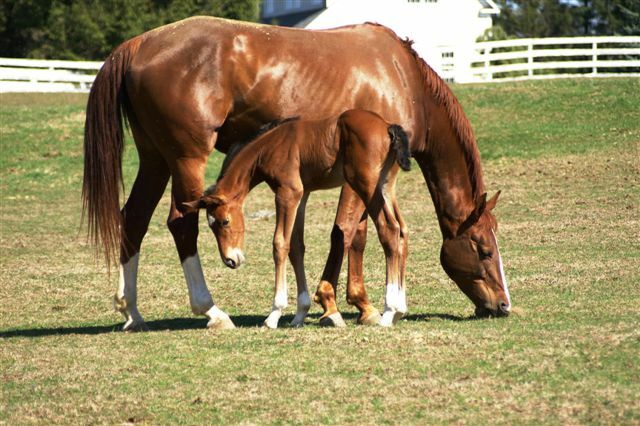 She looks a lot like her mother, but with Gold Luck's better loin connection and his chestnut with white coloring. She is friendly and personable. A scar on her pastern with some thickening behind it reduces her price. This never caused any lameness, and shouldn't even be noticed as she matures and grows into it. SOLD! Congratulations to Margaret Scarff of White Hall, MD! 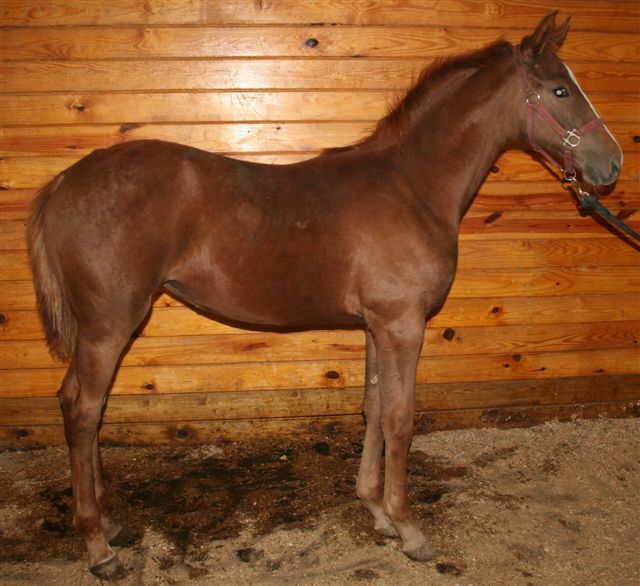 This is a gorgeous big chestnut colt with a blaze, two socks behind. SOLD! congratulations to Robert Askew of Centreville, VA! See the new conformation photo taken 9/06. Lhauren is maturing into a beauty. She is correct, sweet and a super mover. 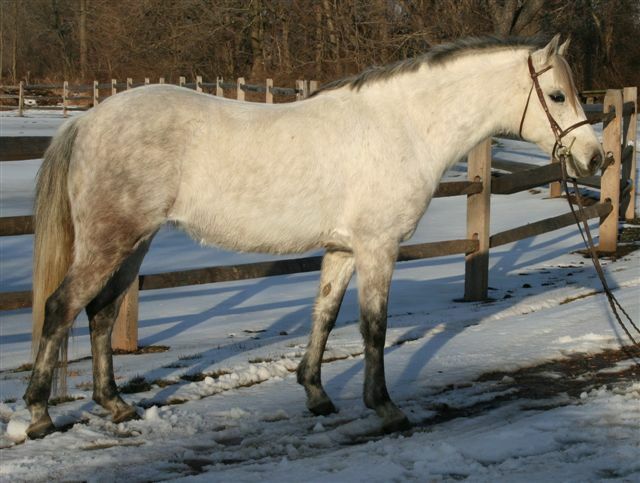 She could show on the line for dressage or for hunters with her very free shoulder and good activity from behind. SOLD! Congratulations to Gig Pindar of Hazelton, PA! 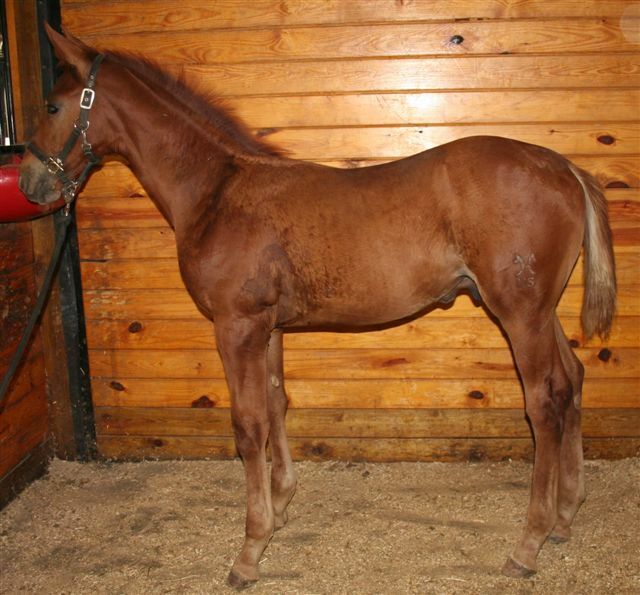 This filly is a twin of Lhoretta, her full sister born last year. 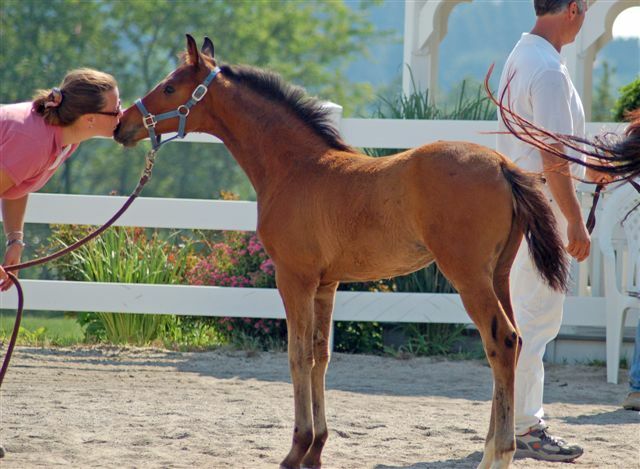 She is a friendly foal and is a real beauty. She was born late at night, so I was still able to get a few hours sleep before the next foal was born at 10 am the following day. SOLD! Congratulations to Amy Chilcoat! See the new conformation photo taken 9/06. Lhevi will be tall and substantial without being common. He has a beauty from his dad, Loerke. He is a good mover and has a lot of air time with a free shoulder which will make him suitable for dressage or for the hunter ring. Plus, he has a quiet character. See the new conformation photo taken 9/06. He just keeps getting prettier and prettier and he can really move. Lhincoln resembles his father, Londonderry in his type and his movement. 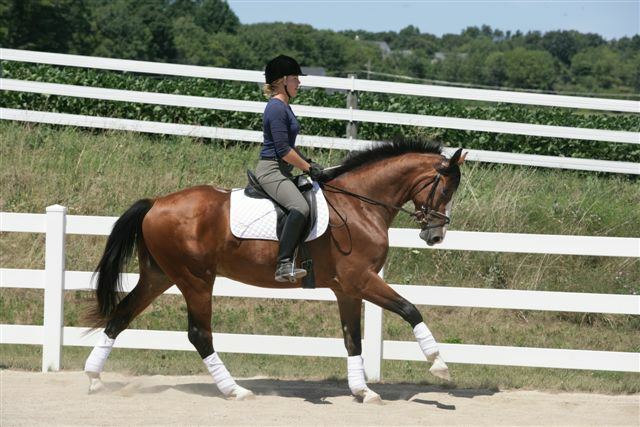 He is uphill and elastic with just enough knee to allow for upper level dressage movements like passage and piaffe. 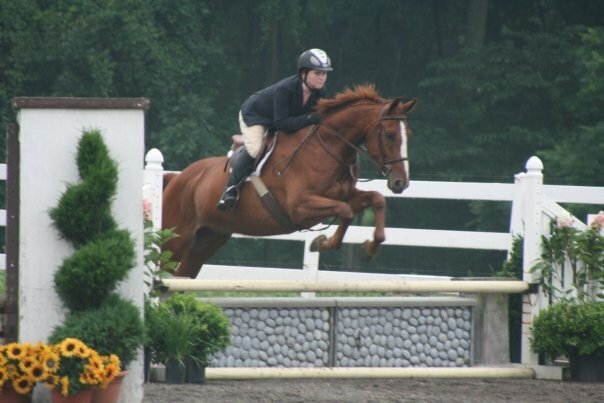 His looks and elasticity may appeal to hunter riders, too. Plus, he is really sweet and quiet in his character. SOLD! congratulations to Ashley Burd! Wanda had a chestnut colt with much drama of pain after passing the placenta. I thought she was going to roll on him, but he was smart and scooted out of the way. SOLD! Congratulations to Karen and Carly Graziano! Check out the new photos of Rhecipe, now that she is maturing nicely. What a beauty and she can really move! SOLD! Congratulations to Craig Eberbach and Phoebe DeMott! One of the group purchase we made in 2004 at a breeder's farm near Frankfort. SOLD! Congratulations to John McGuire of Elburn, IL! See the new conformation photo taken 9/06. Sorry for the poor quality of the conformation poses. He was the first one we did- before we got a system that showed them the best! Whinston was born with perfect conformation and now we can say that he has movement to match. 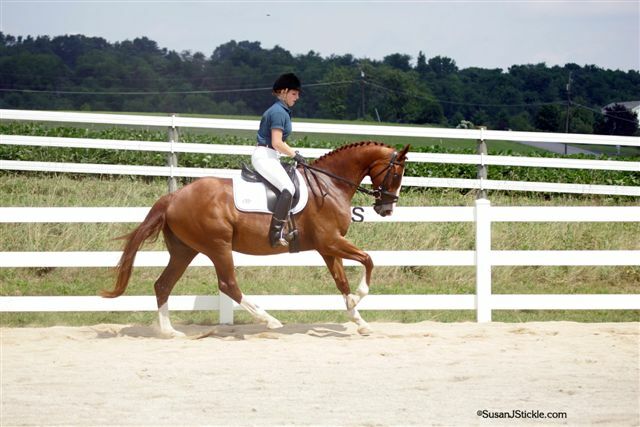 He moves uphill, in good rhythm and is free in his joints both front and hind. I think this one will have the ability to really sit on his haunches- dressage riders take note!